Get your slatwall hangrails in a variety of sizes! 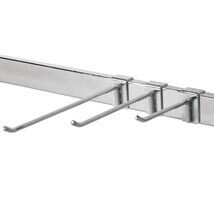 These Chrome Peg Hooks hang from rectangular hang rails. Available in a variety of sizes.